Small business are calling on the government to change the law to stop the sale of VAT-free CDs from Jersey by major supermarket chains Asda and Tesco. 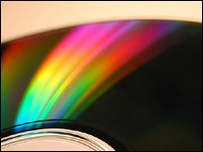 Asda began its offshore operation two weeks ago, with its entire 140,000 CD, DVD and video lines for sale. Tesco has been selling chart CDs from Jersey since last December, and both have reported strong interest in their products. Jersey has no VAT on goods sold there, and, as long as items cost less than £18 and are posted individually, Revenue & Customs cannot impose tax when the goods are brought into mainland UK. The supermarket giants say they are simply giving their customers the best deal they can and that they will comply with any future changes in the law. During a Parliamentary debate in February it was stated that the Treasury is currently losing £80m a year from retailers operating "offshore" and that could soon reach £200m a year. The Treasury says it has the matter "under review". Meanwhile, small retailers in the High Street say they cannot compete with the low cost CDs being sold from Jersey by Tesco and Asda. At present Asda Entertainment is selling Coldplay's X And Y album for £8.47, and Tesco for £8.99, both prices including postage. This is lower than the majority of High Street retailers. "This latest venture by Asda has got to be the final straw, it is becoming utterly absurd," says the Forum of Private Business' (FPB) chief executive Nick Goulding. "The supermarket giants are now slugging it out against each other charging these ridiculously cheap prices, by exploiting the Jersey loophole, that the High Street simply cannot compete with." How are we supposed to compete when the likes of Tesco are advertising CDs that are cheaper than we can buy them from the distributors? The FPB, which represents small and medium-sized firms, has already lobbied the Treasury on the "dire need" to close this loophole "once and for all". Mr Goulding said everything has to be done to help independent shops survive and compete. FPB member, Les Hare, owner of Kingbee Records in Manchester, said he was angry at the way the Jersey loophole was being used. "Of course our business is being affected by the unfair competition from the supermarkets, and this Jersey loophole is just another example," he said. He said his "core business has been gradually eroded" by the supermarkets selling from Jersey. "In the past, we would see a healthy increase in sales over the festive period, but now there's barely any change to our general turnover," he added. "How are we supposed to compete when the likes of Tesco are advertising CDs that are cheaper than we can buy them from the distributors?" Other retailers such as Amazon and Boots also have operations in the Channel Island, and Asda and Tesco insist they are merely going with the flow. "We would be failing our customers if we did not give items at the cheapest price we could," says Nick Agarwal. "Since we started the operation we have had thousands of shoppers taking advantage of our prices. 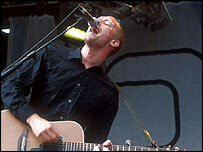 "We are being very supportive of the music industry by what we are doing. In our stores we have an extensive range for sale but obviously cannot provide our complete number of lines." He said that some of Asda's best competitors were small retailers. Mr Agarwal added that if the government changes the rules "Asda will abide by that". 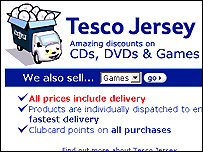 The FPB says Tesco sparked a price war in December 2004 when it set up an offshoot from its website called Tesco Jersey, selling CDs for £8.99 and DVDs for £11.89. "The big online music retailers have been selling through Jersey for much longer than we have," says a Tesco spokesman. "We have only moved our chart CD offer to Jersey, while other music remains for sale on our main website." Like Asda, Tesco says the decision was taken to "remain competitive and provide the best price for our customers". And it too says it will abide by any Treasury changes. "We are aware that businesses do locate off-shore for a variety of commercial reasons and sell goods and services to customers in the UK," says a Treasury spokesman. "Goods imported into the UK are generally chargeable with VAT. The rules in this area are complex and vary depending on the nature of the supply and the value of the supply and we keep the matter under review. "The government is committed to taking firm action to address any kind of arrangement which is set up artificially with the objective of avoiding paying a fair share of tax. "